There's an initial sweetness, but soon taken over by a considerable smoky flavor, with hints of tomato sauce. The chewing brings on an explosion of flavors, mostly as a savory blend of seasonings and marinades. It's definitely reminiscent of barbecue sauce, particularly with the tomatoey base flavor, the complexity of seasonings, and the smokiness. 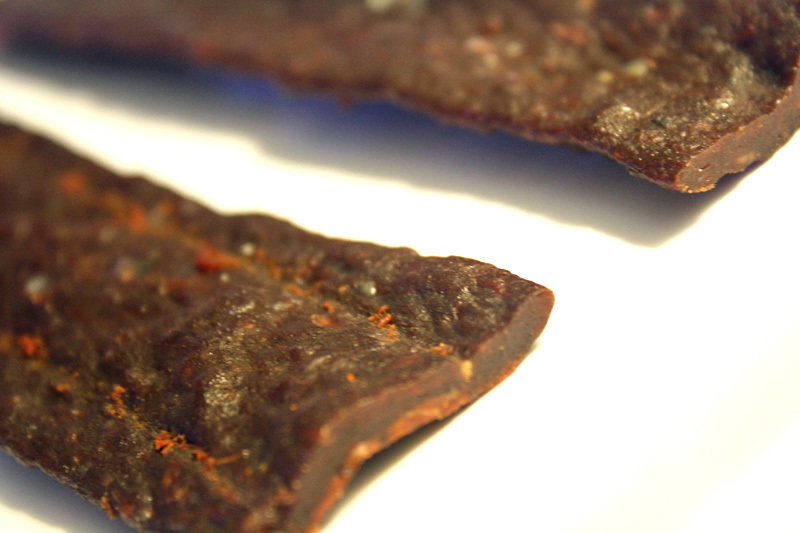 The flavors that seem to define this jerky is largely barbecue sauce with a strong sweetness and a fair amount of smokiness. It has a bold character from the seasonings and a bit of a spicy bite from the peppers. As far that spiciness goes, there's just a little bit of heat to this. I'd rate it as "mild medium" on my personal heat scale (level 2 out of 5). The meat consistency is chopped and formed beef. 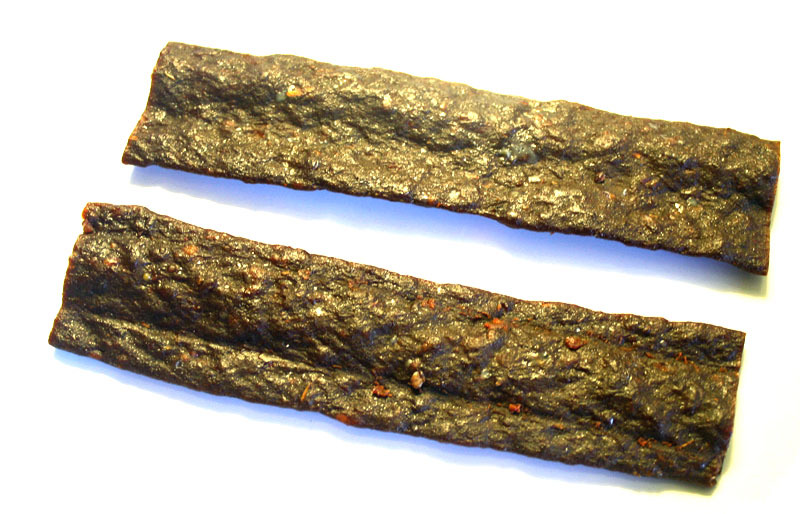 It chews mostly as all meat, showing nothing unchewable or crunchy. It tends to chew crumbly due to the chopped and form nature, and it also feels a little rubbery. However, it chews rather easily, and could even be considered soft and tender. There's a light bit of greasy film left on my fingers. 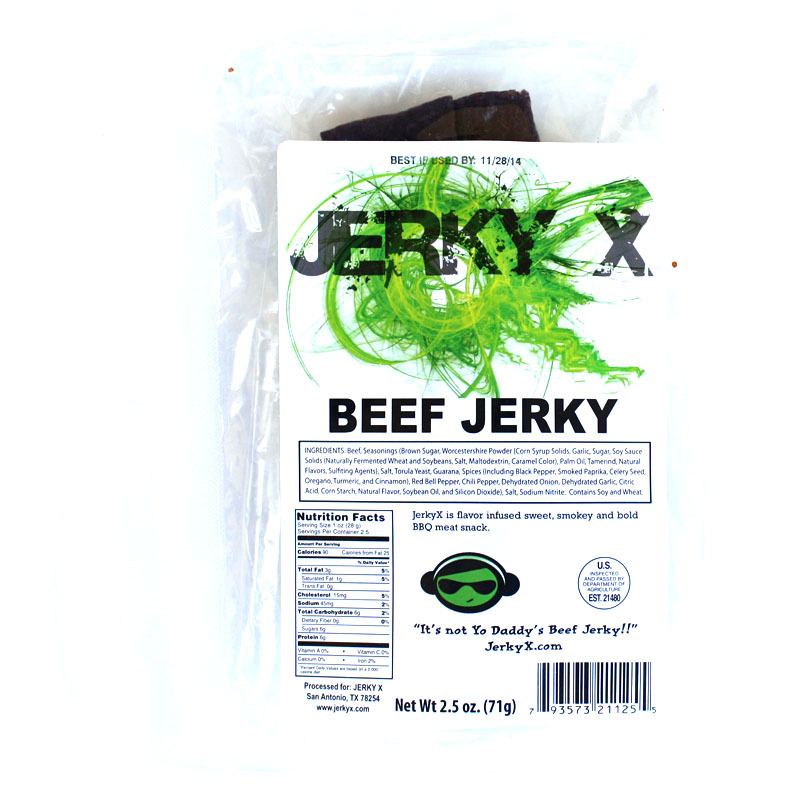 Verdict: JerkyX generates a lot of flavor, mostly comparable to barbecue sauce, with its sweet, smoky, spicy character. I found lot of snackability in each bite, and would market really well to gamers, coders, truckers, and anyone else who need to stay up late. It has a touch of spiciness to keep things interesting, and a nice smokiness for the die-hard carnivores. I didn't get any natural meat flavors, and the chewing seemed crumbly and rubbery, but I think the bold flavors do well enough.